ABB, the power and automation technology group, has commissioned a switchgear rated to handle more than one million volts (1,100kV), touching new heights in terms of global voltage levels. 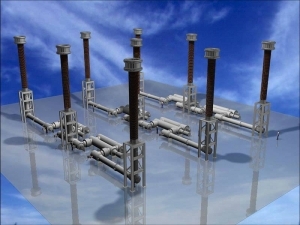 The ultrahigh-voltage gas-insulated switchgear (GIS) has a switching capability of 6,900 megawatts, which means it can turn power equivalent to the average electrical consumption of Switzerland, a country with more than 7 million inhabitants, on or off within milliseconds. ABB designed, tested and commissioned the GIS for a pilot project launched in 2006 by State Grid Corporation of China to demonstrate the feasibility of AC power transmission at ultrahigh voltage. The GIS is a central component of ultrahigh-voltage electricity transmission designed to carry huge amounts of electricity over vast distances with very low losses. ABB completed the assignment in just two years with technology partner Xian Shiky, a leading Chinese switchgear manufacturer who worked in close co-operation with ABB throughout the project. “This is a breakthrough that will serve as a benchmark for future ultrahigh-voltage projects and is another example of ABB’s constant quest for technological innovation and commitment to energy efficiency,” said Bernhard Jucker, head of ABB’s Power Products division. State Grid has announced plans to invest more than $14 billion in the next three to four years to expand its ultrahigh-voltage (UHV) network. Ultrahigh voltage transmission reduces power losses and requires a smaller transmission corridor than conventional technologies. It is particularly suitable for countries like China, where energy resources are often far from the centers of power consumption. ABB pioneered gas-insulated switchgear 50 years ago. This application level is the biggest leap in capacity and efficiency of AC power transmission in more than two decades.